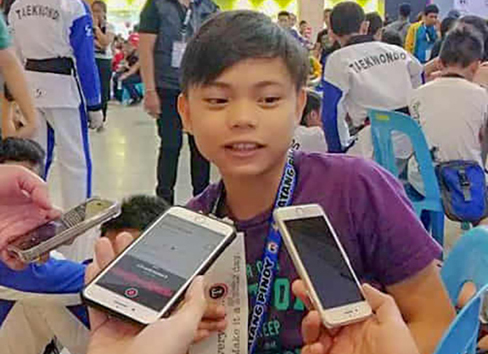 Tagum City—Paul Anthony Rodriguez made his presence felt when he scooped three gold medals in the taekwondo competition of the 2019 Batang Pinoy Mindanao leg Tuesday at the Gaisano Mall here. Competing under the banner of Gen. Santos City, the 13-year-old Rodriguez ruled the junior individual, junior pair and junior team poomsae events to emerge as the most successful athlete in the early stretch of this prestigious multi-sport competition. He scored 7.815 points to edge Clint Solitana of Malita (7.335) and Daniel Abella of Cagayan de Oro (7.130) to clinch his first gold medal in this event organized by the Philippine Sports Commission and Province of Davao del Norte with STI College-Tagum and Alfalink Total Solutions Corp. as major backers. Then, he partnered with Aleya Rayzel Labao to reign supreme in the pair event with a total score of 8.020 points, leaving Ezekiel Limpin and Aliyah Baquial also of Gen. Santos City (7.550) and Abella and Kyle Canios of Cagayan de Oro (7.485) settling for the silver and bronze medals, respectively. To complete his triple crown, Rodriguez connived with Limpin and Benedict Opao for a total score of 7.685 points to capture the gold in team event, while Nica Indino, Abdul Usop and Henry Lu of Maguindanao (7.400); and Earl Visaya, Louise Valle and Hannah Blanagan of Davao del Norte (7.350) claimed the silver and bronze medals, respectively. The victory was such an impressive feat for Rodriguez, who has been dreaming someday making it to the Olympics. Rodriguez’s triumph is just half of the story on a very busy day in this conclave that is part of the government’s grassroots sports program for young athletes 15-years old and below. In archery, South Cotabato bet Grace Signacion and Koronadal City’s Justin Matthew Basadre followed up their golden victories in the yeoman girls’ 20-meter and bowman boys 30-meter events by topping their respective individual Olympic round division. Signacion edged Koronadal City’s Samantha Isabel Loreno in the yeoman girls’ final round, while Basadre defeated South Cotabato’s Quin Myer Loreno in the bowman boys. Karl David Mejillano and Geanne Gasendo of South Cotabato shared the podium by triumphing in the yeoman boys and bowman girls’ individual Olympic rounds. Over at the Bulwagang Pangkarunungan, Gen. Santos City bagged two of the four gold medals at stake in rapid chess. Clint Calvin Atoc ruled all six rounds of the boys 12-under class to finish with six points for the gold medal, beating Dipolog City’s Ghian Michael Aleria (5 points) and Gov. Generoso’s Kyle Johann Ylanan (4.5 points). Haein Angelito Aparte, meanwhile, ruled the boys’ 13-15 division via a superior tiebreak after he and Kidapawan’s Nick Danuel Pabroquez finished with identical 5 points. Aliyah Rae Lumangtad of host province also won after tiebreak, beating Cotabato Province’s Joannah Love Marie Olay for the girls’ 13-15 gold. Cagayan de Oro’s Ruelle Canino also shared the podium after finishing with 5.5 points for the girls’ 12-under gold.